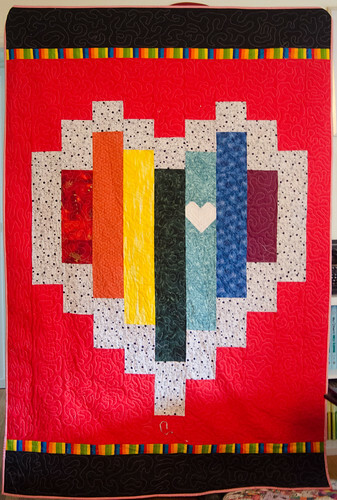 Ever since Sam Hunter posted her modifications to her Big Hearted design, I've been thinking about doing some Pride-themed quilts. I'd been thinking a lot about the concept of inclusion, and the difference between talking the talk and walking the walk, and I realized I had some friends who could honestly use to see me say I see you, and I'm willing to put my hands and my time together to not just say you matter, but demonstrate it as well. sewn in the same week, quilted in the same manner, use Marimekko backings I brought back from Denmark years ago, and were mailed out on the same day. They are fraternal twins in every sense of the word; change the background colors and the backing, and they are otherwise identical. Both contain messages that have meaning to the recipients. 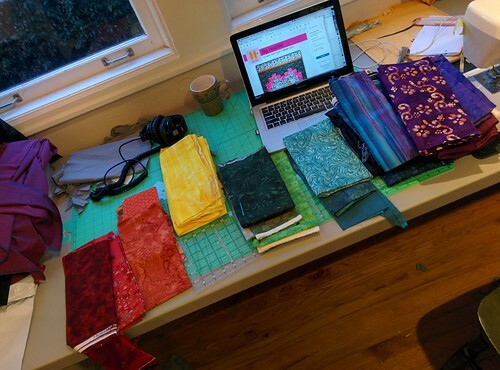 This quilt went to the same family as Cat's Cradle, but for very different reasons; one is for the children and one is for their mother. I love many of the people I met in the decades I lived in the American South. I carry the accent —an auditory marker —of a place that is frequently actively hostile to my LGBT+ friends. I struggle to reconcile the message of the prevalent religion of the area with the actions of its followers, especially where my LGBT+ friends are concerned. I will spend much of the rest of my life acknowledging the braver choice would have been to stay and fight, rather than to relocate to a portion of the country where my views are the norm. My friends who have stayed in the American South are the ones who are fighting the good fight. I'm out here in a liberal little bastion in a liberal little state on a liberal coast; those friends are the ones who make the daily choice to … remain. Be present. Refuse to cede ground. If you want the definition of a heart that fights the good fight, it's the mother of a transgender child in Alabama.